and lace up boots in the fall, but for now cut offs and a simple denim shirt works just fine. pull out my favorite vintage (polyester) blouse. Weather please stay this way for a little while! I agree totally!!!! It' s great!!! Greetings from a SPANISH BLOGGER IN LONDON!!!! the bell sleeves are really amazing! so funny about what your boyfriend said. enjoy the weather! Learning not to always take my husband's view on my style too seriously has been an important process in my personal style journey for sure! I adore the lace cardigan, very very sweet. Bonnie, I absolutely adore this look on you. The top is heavenly! I am such a sucker for bell sleeved tops, need to have one of those in my closet right now. Enjoy the lovely autumnal weather girl! That lace jacket is amazing, perfect for fall. I do love the mix of blues/jeans. Oh how I love lace, it's so pretty and chic! Fantastic touch!!! I LOVE the bell sleeves and the lace. love the lace cardi! and you have some of the best bags, i tell ya! so cute ! ^^ i have a short lace cardi, but grey, that used to belong to my mum..! must try it on sometimes since this look is so stunning. you are so sweet , love the white lace on you ! 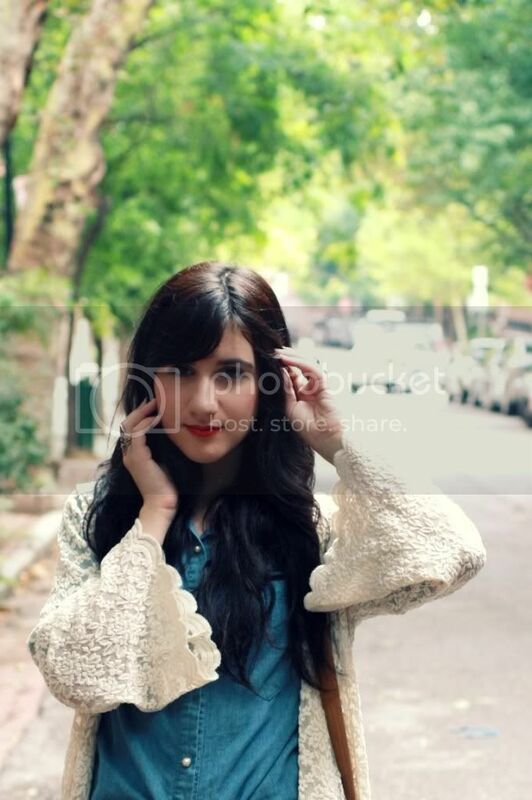 love this outfit the lace cardigan is adorable the sleeves are so cute! guys really don't understand but it's sweet when they try! you are just beautiful!! and the white cardi is fabulous!! Your cardigan is so adorable. I love the sleeves! What a great detail in addition to the lace. yeah guys can be silly sometimes! incredible photos as always! new post on my blog: I waiting for u! such a cute sweater! i love the flared sleeves so much! You never cease to amaze me with your awesome ideas. Who would have thought to put the lace cardi over a jean blouse. You look gorgeous, I especially love that last shot of you...and yes!! boys are hilarious when it comes to commenting on outfits...but I am glad you ignored him because you look amazing! gorgeous! i love your lace jacket! 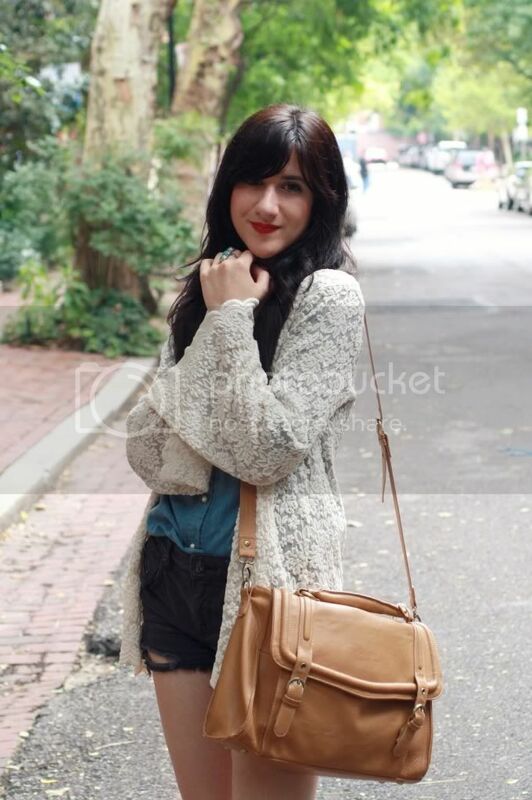 love the bag and the cardigan! cool photos! you look great! Hey Bonnie. What a beautiful cardigan, I love how you have paired it with a pair of cut off denim shorts! Ha ha! Led Zeppelin! XD ~That is pretty funny! That cardigan is gorgeous though, and I love how it matches your lipstick and hair (I have a thing for red, white, and black). I guess saying it reminds him of Robert Plant is still a great compliment!! 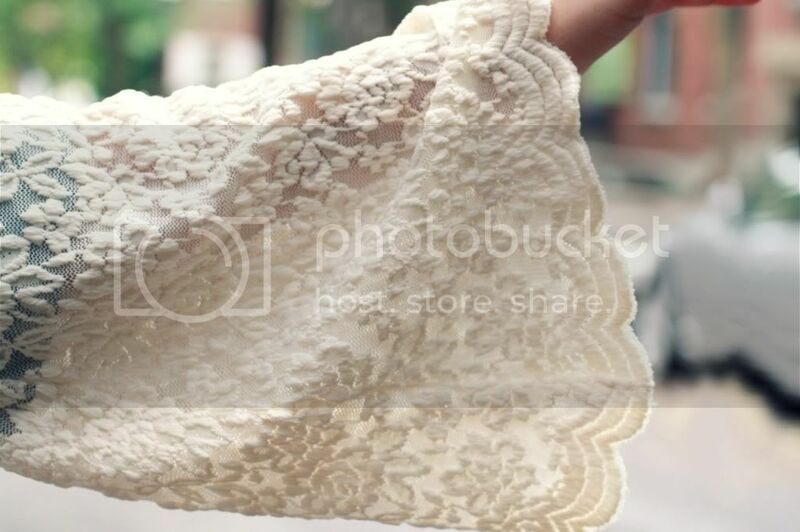 Haha I love it, lace is always beautiful, and the sleeves are wonderful! I've gotta get that cardigan. It's so pretty!! LOVE the way you styled this cardigan...the sleeves are great, and I can definitely see it moving through the seasons with a variety of different styling options. Boys ARE funny...my hubby recently told me I was wearing an "Egyptian princess" necklace when it's really this fancy statement piece that's gold lace. I'm so jealous of your 60 degree day! I love the pretty lace cardigan you're wearing too. Boyfriends do always have interesting opinions and comments on our outfits, don't they? I love the combination of modern from the shorts and shirt with sweet, feminine, vintage-y from the cardigan. Very nice. I really love this white lace cardigan!! So pretty and lovely. What an intricate design! Oh dear, I am in love with your lace cardigan! I'm following you from now on! Wow this lace cardi looks stunning! Such a good idea to combine it with simple shorts and a shirt, it's a great mix of casual and quirky! And I love these pretty shoes! Your style is so lovely ♥ Just gorgeous! Boyfriend's provide the best commentary! I can see why you are loving this lace cardigan, the sleeves are darling and give you such great movement! I'm looking forward to fall now the the temperatures have started to cool. Can't wait to break out the booties and tights! Hello, Your look is a Great outfit bautiful. Kiss. Gorgeous lace cardi. Love the bell sleeves. such a cute cardigan! great blog, hun! That is one AMAZING cardigan! Lusting! This jacket is so awesome!!! This outfit is gorgeous, I love what Ryan said about it! Haha! I think you look beautiful, silly boys! ;D. I am also in love with your shorts! Love this outfit. Definitely glad I found your blog. adorable! the cardigan is super cute. mmm chunky scarves! haha my favorite. Love the cardigan!!!! It's beautiful. The white lace is amazing! I have that exact same cardigan. It's so amazing with everything. I adore your bag and your cardigan is amazing! you are so different! !I feel a little jelous inside.hahah !